The Rules Editor provides a visual interface for creating rules to be used for mutating the passwords read from the dictionaries. To describe the rules, the application has a built-in macro language. You can save the rules created in the Rules Editor to a file, and then load that file for a dictionary-based attack. 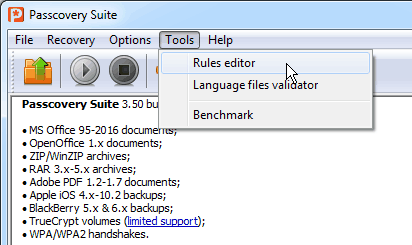 To invoke the Editor via the application menu (Tools->Rules Editor). Using the Editor is very simple. It consists of a tool bar (1), a list of test words (2), an edit box (3), and a result box (4). When you define the rules, the Editor immediately compiles and displays mutated password test values. 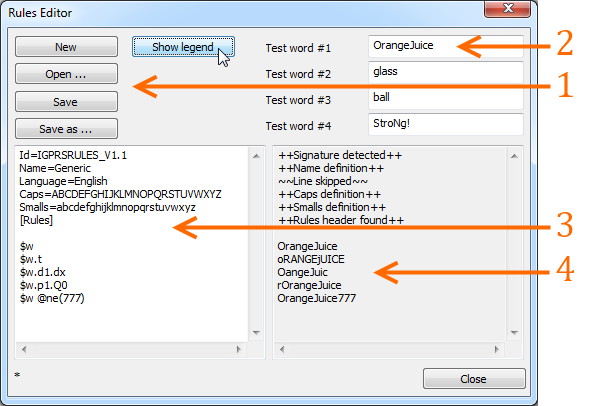 To make using the Editor even easier, it can display hints on the macro language. To see a hint, click the “Show legend”. When rules are complete, remember to save them to a file, which you can load for a dictionary-based attack.